So I was in therapy this week. (Like I do.) I was talking to my therapist about feeling safe. The “freedom of safety” as I call it. For years I have talked about the same theme in therapy (different situations, same theme). I want freedom. I was to feel safe. I want to not wait for the other shoe to drop. I want to trust the people around me. That they won’t hurt me (emotionally, physically, sexually). That I won’t be manipulated (see previous sentence). That I will be safe. Safe is a word I use a lot. It goes hand and hand with trust. I want to be myself, truly be myself. In order to do that I need to believe that the people around me will accept me, I need the confidence that if they don’t, that I will be able to shake the dust off my feet. I need to express my needs without (undo) criticism, I need the safe space to have what I’m feeling and experiencing be heard, and, well, believed. I have never found this space. Ever. I have moments, glimpses. A brief second in the most intimate moments with the people I love and trust the most, I see my free, safe, authentic self come out to play. And then she goes back into hiding, scared by the world, not wanting to be hurt. So today, as I describe wanting this feeling again (and here’s how it’s manifesting itself this time…) my therapist told me to be nice to myself. He called it a “just because” present. Or a “thanks for all you do” present. It didn’t have to be a “thing” but it ended up being one. It’s not that my life is harder than anyone else’s or that my shadow is necessarily bigger, but as I left his office I realized that I no longer had the money to do the things I used to for self care. Let’s be honest. Self care is essential (especially for care givers) to feel safe. A retreat or a massage was my lifeline when there were too many deaths or pastoral crisis in a short amount of time. I used to go out to dinner with friends and talk for hours when my life was falling apart or visit them “just because.” I used to have the money to do little things for myself to say “thank you” for mustering enough courage to let others in, to risk being hurt, to mourn, to grieve, to appreciate myself and how hard life has been. But I no longer do. I started giving myself small presents years ago to say “thanks for all you do for me” because I couldn’t expect others to, and so instead of being consistently disappointed, I got them for myself. So as I left my therapist’s office I asked myself: What would be something (an inexpensive something) that would allow me to be reminded that I am okay? I am safe. I am free. So I bought myself my favorite thing in the world. Flowers. Call me a cliche but I love flowers. I love wild flowers, really any flowers that are fresh cut from a garden. So I stopped and got flowers cut from a local farm, I came home and put them in a vase and added some hydrangeas from my own garden. I spent less that $20. If I could I would have fresh flowers everywhere. I love them that much, they are, as silly as it may sound, the touchstone that reminds me of freedom and safety in the midst of my fragility. As I drove to work this morning a mower was buzzing wildflowers from the sides of the highways. I wanted to stop and go pick them all before he did. Wildflowers, or fresh cut flowers in general, remind me of the beauty of impermanence, the essence of fragility. 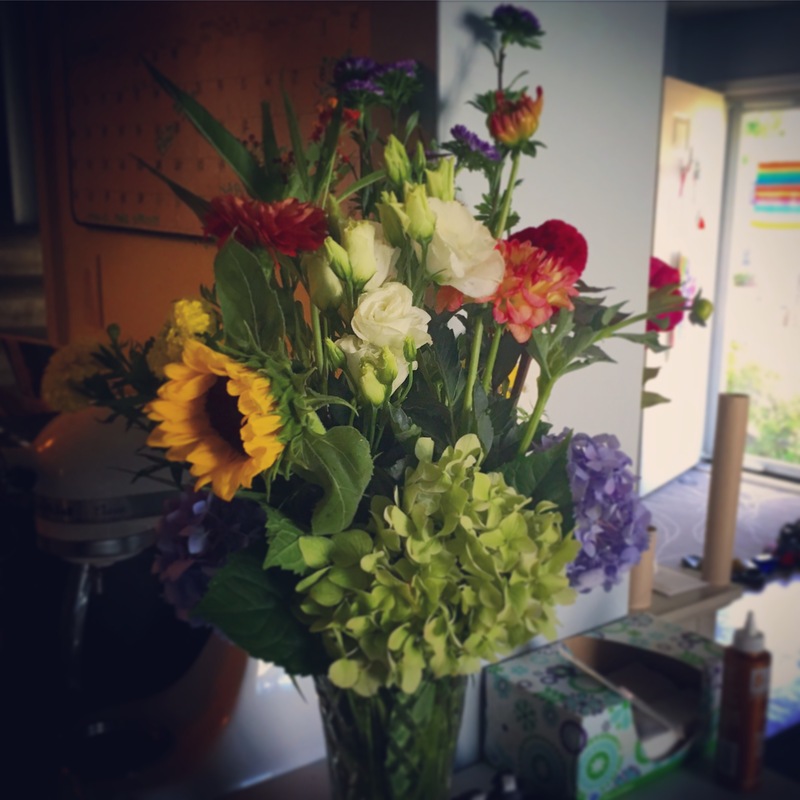 And before you begin to suspect, yes, my boyfriend knows and no, this is not a plea for him to buy me flowers. He has, for your information, planted hundreds of flowers in our gardens. (even though he will only refer to them as “pollinators.”) For our first date he bought me white lilies with red gerber daisies. I know after some time they will die, I know I can’t carry them around with me where ever I go (although I will carry them room to room for a while). I know that just like the trips and dinners with friends, the massages, and the retreats their effects will wear off and I will need another touchstone. So, for now, I will enjoy my stunning symbols of fragile openness, of safety from hostile environments, of freedom to bloom and be loved for it. I pray I can see the same in myself. You are a cliche – me too!